Chicanery, greed, politics, battles won and lost: welcome to the Food and Drug Administration. New York Times science reporter Hilts (Memory’s Ghost, 1998, etc.) has no doubts about the need for an independent FDA to protect the public’s health, and he has no qualms about identifying the forces that have attempted to thwart its mission. From passage of the Food and Drug Act of 1906, shortly after Upton Sinclair’s The Jungle aroused public outrage over the meatpacking industry, to passage of the Kefauver-Harris amendments in 1962, spurred by furor over the thalidomide disaster, Hilts shows how commerce, politics, and events have shaped the evolving role of the FDA. Born in the Progressive Era as the US Department of Agriculture’s Bureau of Chemistry but hobbled by minimal budgets and authority, the FDA had little effectiveness until the Food, Drug, and Cosmetic Act of 1938, sparked by public concern over children’s deaths caused by sulfanilamide, gave it the job of checking drugs before they went to market. 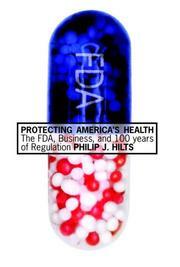 Hilts examines the growth of the giant pharmaceutical industry, the rise of a conservative movement opposed to government regulation, and the policies and styles of FDA commissioners. He shows how controlled scientific studies became the standard for determining a drug’s safety and effectiveness and how the often-beleaguered agency’s professionalism was established. Among the many battles he recounts were those over package-insert information, nutrition labeling on processed foods, silicone breast implants, development of AIDS drugs, and recall of drugs hazardous to health but profitable to pharmaceutical companies. Common sense, says Hilts, demands that businesses, whose first job is profits, be countered by a regulatory agency whose first job is public safety. As imperfect as the FDA is, he states, duly noting the payoff scandals of the late 1980s, its work remains essential. Rousing and readable: sure to brings smiles at the FDA and howls of protest from industry lobbyists.